Jack-O-Lantern Cheeseburgers, A Halloween Recipe That Kids Will Love! How about serving this ghoulishly fun recipe this Halloween? Kids will enjoy helping you make this one as much as they will enjoy eating them! You can use ground beef for this recipe, or healthier alternatives such as ground turkey or soy burger patties. Whichever you choose, one pound will be sufficient for making four of the jack-o-lantern cheeseburgers. Increase the amount of patties depending on appetites and number of guests being served. You can also choose to make the smaller sliders if you are having a children’s party. Make sure you have condiments by the serving platter like ketchup and mustard. I also like to have small bowls filled with extras such as chopped onion, dill pickle slices, jalapeno pepper slices and maybe some relish. Put out whatever you feel your guests may like. A big bowl of potato chips will come in handy as well. You may also want to set out some Halloween themed paper plates and napkins. Todd has a different twist on this recipe in that he mixes his meat with chopped onion and parsley before frying it. You can do that too if you wish. 1. Cut desired faces in the cheese. This is the fun part. Be sure to get the kids involved and tell them to use their imagination with the faces. The squares of cheese will have to be re-sized if you are making sliders. 2. Shape your hamburger patties and fry over medium high heat until brown and crisp. I like using a cast iron frying pan. Nothing browns like cast iron. Caution: Keep kids away from cast iron pans, or anything on the stove depending on their age. 3. Toast your buns in a toaster oven or the broiler on your stove. I like lightly buttering the buns before toasting them. This way they turn out golden and very tasty! 4. Put your cheese slices on the burgers and leave them open faced on a serving tray. Keep the bun tops nearby. 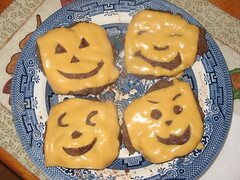 I hope you will enjoy these fun jack-o-lantern cheeseburgers at your next Halloween party! Cheese burgers are my favorite kind of burger, and these look great for Halloween. I can see these being very popular with kids. I agree that these would be great for the kids! I especially like the slider idea I came up with. All you have to do is use dinner rolls and cut the cheese slices by putting a drinking glass on the cheese slice and make a circle. Then cut out the face you want on each. These cheeseburgers rock! My kids want your slider version all the time now-lol! Glad your kids are enjoying the sliders, Gilberto. Are they helping you make them? Loads of fun for the kids!